The University of Sheffield Advanced Manufacturing Research Centre (AMRC) with Boeing, will lead a new £6m European-funded project to develop an advanced lightweight alloy for the aerospace industry. Securing funding via the European Commission's Horizon 2020 programme, the MMTech project will develop new ways of working with an advanced material called gamma titanium aluminide. Horizon 2020 is the biggest EU Research and Innovation programme ever with nearly €80 billion of funding available over seven years (2014 to 2020). Led by industry, the projects ensure Europe produces world-class science, removes barriers to innovation and makes it easier for the public and private sectors to work together in delivering innovation. The ultimate aim is for projects to be a means to drive economic growth and create jobs. Based on the Advanced Manufacturing Park (AMP) and a partner in the HVM Catapult (the government's strategic initiative that aims to revitalise the manufacturing industry), the AMRC focuses on advanced machining and materials research for aerospace and other high-value manufacturing sectors. A partnership between industry and academia, which has become a model for research centres worldwide, the AMRC generates income from private sector members such as Boeing, Airbus, Sarfran and Rolls-Royce and government and European funding like Horizon 2020. The AMRC has previously led European-funded projects to develop innovative technologies including metals additive manufacturing for aerospace, environmentally-friendly manufacturing techniques for composites, factory design and advanced assembly technologies. The research consortium for MMTech includes two Rotherham-based SMEs – precision engineer Advanced Manufacturing (Sheffield) Ltd, and technology development specialist Teks Sarl Ltd – as well as industry partners from France, Italy and Spain. The project will also involve specialist researchers at the University of Strathclyde and Imperial College London in the UK, and Mondragon University and the IK4-Ideko research centre in Spain. The Nuclear AMRC will work alongside its sister centre to apply techniques such as laser cladding to the alloy. Professor Keith Ridgway CBE, executive dean of the University of Sheffield AMRC, said: "Titanium aluminide is very light and strong, particularly at high temperatures, which makes it a very attractive material for aero engine components. "Unfortunately, it is notoriously difficult to use. This project will examine new powder production methods, and new casting, machining and 3D printing techniques." 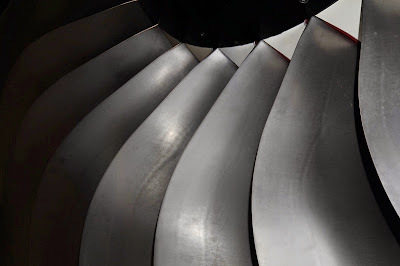 The aim is to develop new techniques to manufacture and repair turbine blades and other aeroengine components, using titanium aluminide. In November, Professor Ridgway outlined plans for the ground-breaking centre to more than double its turnover to in excess of £80m over the next five years.